Recliners are nice, but these are sheer bliss. Adults-only beachfront bar, shaped in the Omni Hibiscus. Feast on tuna rolls without missing a minute of sunshine. Meals in the resort's restaurants, room service and drinks are part of the all-inclusive package. This resort is located on a beautiful white-sand beach. Your kids will love the daily activities and kid's pool. Children ages 5 to 12 can join the Cancun Kid's Club. Kuku's Jacuzzi Beach features lunch specialties and a full bar. Relax with a facial, massage or a body treatment. The Omni Cancun Hotel & Villas All Inclusive is abuzz with activities that will keep your crew hopping. Start each day by checking the daily calendar for details on the activities such as beach volleyball, poolside games, and the weekly kids’ bash; it has a piñata! When it comes to underwater fun, the resort has you covered. The elaborate pool area features three outdoor pools and a thirty-six-person hot tub. Relax in a sunken chaise lounge with a drink from the poolside bar & grill and keep an eye on the little ones playing in the shallow children’s pool and splash fountain. Hide out under a complimentary palapa on the beach or spring for a Thai beach bed with cabana curtains. After the beach, let the kids hang out at the on-site children’s club while you get your cardio on in the fitness center or enjoy a massage at the full-service spa. Choose an all-inclusive plan to take the hassle out of your vacation. Air-conditioned three-bedroom villas spoil you with a spacious two-thousand-square-feet of living area, including a first-floor garden terrace, second-floor balcony overlooking the pool and glorious Caribbean, plus a third-floor sun terrace. You’ll have more than enough room for the kids and their toys, blankets, and games. Full kitchens allow you to make and serve meals in your villa, or dine at one of the six on-site restaurants. There’s no need to worry about missing this week’s episode of your favorite show thanks to the flat screen TV with premium cable. Or catch a Friends rerun or the big game. Keep in mind that villas are three-story and have stairs. Omni Cancun Hotel & Villas is just a short drive to Luxury Avenue, featuring high-end jewelry, handbags, beauty and fragrance, and apparel. Jewelry brands include Cartier, Pandora, Swarovski, and Bvlgari. Browse the beauty and fragrances from Armani, Burberry, Chanel, Dior, and Estee Lauder. Treat yourself to a new handbag from Longchamp, Fendi, Carolina Herrera, or Fendi. Apparel can be found at BCBG Maxazria, David Salomon, Burberry, Erica Flores, and Pink Magnolia. La Isla Shopping Village features both luxury and more affordable shopping options. Luxury brands include Tiffany & Co., Louis Vuitton, Prada, Rolex, and Emporio Armani. Browse the apparel at Express, Tommy Hilfiger, and Quicksilver. Coach, Kate Spade, and Michael Kors offer handbags. Hungry? Dine at Johnny Rockets, Chili’s, or Italiani’s. Kids will love the Interactive Aquarium; it features over one-thousand aquatic species. 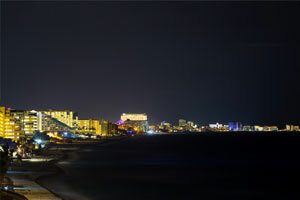 Cancun's Hotel Zone is located on over 12 miles of beautiful beach. Here you'll find the resort to fit your needs, whether traveling as a couple or as a family, no matter your budget. The resorts offer several amenities and activities such as spas, yoga, golf, shopping, and fitness centers. You could also relax on the beach and soak up the sun.